Is there a connection between a beers hop build and how the beer is ultimately rated by the masses? Is there a consensus favorite hop being used? Is there a consensus least favorite hop being used? To attempt to find out I used the hop recipe data collected by Michael Tonsmeire at themadfermentationist.com for 45 different highly rated hoppy beers, For the beer rating data, I used both Beer Advocate and Beer Graphs scoring systems. I took the data of hop recipe information used in each beer and assigned each hop a value of either 1 or 0. A 1 represents that the particular hop was used in the beer and a 0 represents that the hop was not used in the beer. 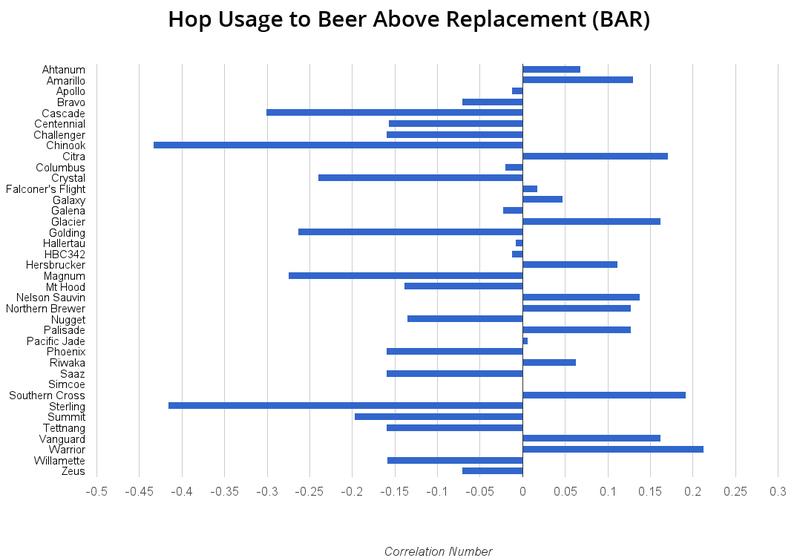 I then ran a correlation between each hops usage for each individual beer to its Beers Above Replacement (BAR) Score (BAR = wOBAR * Volume * Scale). The basic idea is to try to get a correlation (degree to which the variables are related), either positive or negative, of a hops usage in a beer and and the beer’s overall rating. 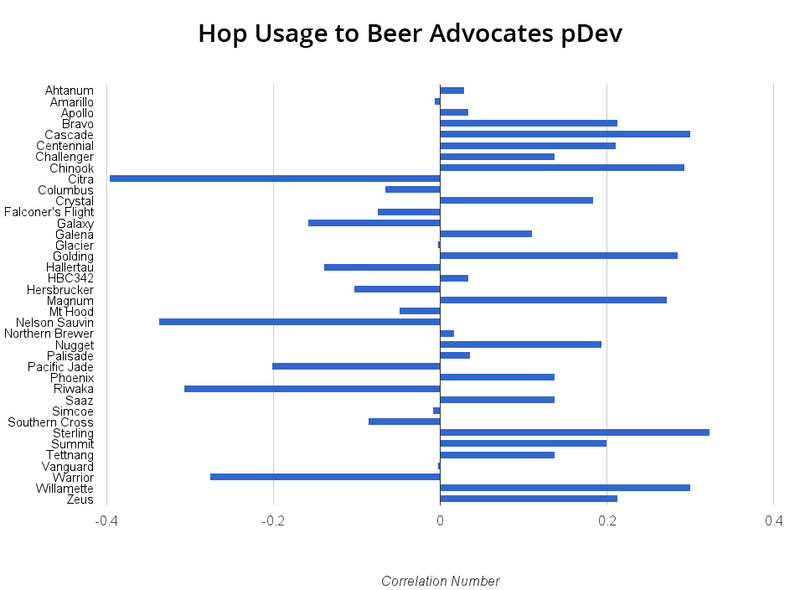 I also ran a correlation between each hops usage in a beer and Beer Advocate’s pDev number (percentage of deviation within the ratings). Comparing the hops usage to pDev shows, in effect, how much agreement there is with a particular hop. A higher pDev score the greater the deviation from the review average while a lower pDev score shows a greater consensus among the reviewers. Here, for a negative correlation we could imply that there is a consensus that most people like that particular hop, where a positive correlation we could imply that people do not agree on whether or not they like that particular hop. Full data set of hops. Full data set of beer scores.